The link on each photo displays a larger image in a new window. I visited a certain Mr Addicott in June 1993. He was at one of his residences, in Farnham, Kent. 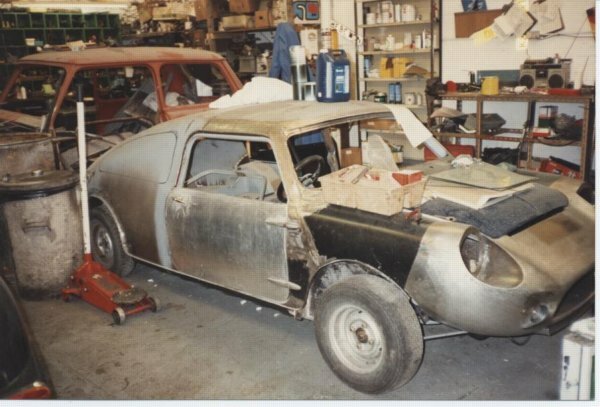 Mr Addicott, or Dizzy to his friends is the father of the Mini DART, a modified steel Mini Van which sits at the top of the Mini-Marcos / Jem / Kingfisher Sprint family tree. What follows is a summary of our conversations which hopefully provide a bit of background to the man, Dizzy, and of course an insight into the birth and development of the Mini DART. Dizzy was christened Desmond Addicott. When at school it was noted that he wasn't a happy soul and he was nick-named him Dismal Desmond. This was subsequently refined to Dizzy when he joined the Airforce in 1941. He became a senior test pilot at Luton, one of the projects he worked on was the Jet Provost. Subsequently he became a BOAC test pilot, then air-show pilot. He flew a B25 and B17 in the film Memphis Belle. Other pilot film credits include Mosquito Squadron (1969) and a Biggles film. Dizzy also cites some involvement with Gary Newman's flying escapades. Dizzy has been married for 30 years. Dizzy was always fond of Minis, particularly the Mini Cooper. He found the idea of streamlining the Mini attractive and decided to develop this idea into a racing/sports car using his knowledge of aerodynamics. Dizzy applied Kamm's theory that a truncated teardrop shape was more efficient than a tapered point. Hence the rear of the car is blunt. Dizzy's project car was named the DART (or Mini DART), the letters standing for Dizzy Addicott Racing Team. The DART started life as a Morris Mini Van purchased for five pounds. The roof was caved in, damaged by something falling on it in a garage (it was not rolled as some people believe). 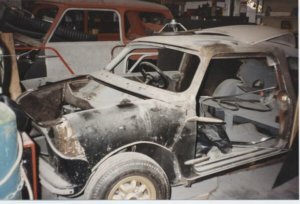 The Mini was not a write-off and the project continued. The Mini Van floorpan was a better starting point than the Mini saloon because it had a longer wheelbase which was more stable at speed. The DART was fabricated from the van shell in steel (not aluminium). The guttering over the door was retained and the car was lowered by removing sections from both the waist and windscreen pillars (a la GT mini). The roof from the B-pillar back was removed and replaced with a sloping section. Unfortunately the chassis of the van twisted when the roof was cut off and thus the DART was a little lop-sided when viewed from the rear. 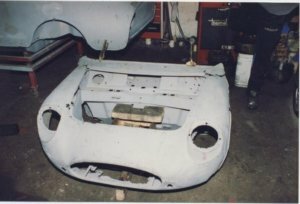 This was one feature that was never really corrected with the fibreglass derivatives and was the very thing that Dizzy objected to in the initial batch of fibreglass shells derived from the DART (Dizzy is a Virgo, a perfectionist). 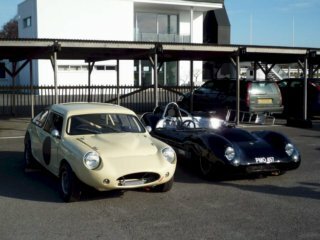 Today you can see that both the Mini Marcos and JEM are slightly assymetric at the rear. Roger King was also a perfectionist and straightened out the Kingfisher Sprint! The high profile of the transverse A-series engine presented a problem for the bonnet line of the car. Dizzy designed an angular rocker cover (pre-dating the MG Metro alloy one by 20 years) to allow a lower bonnet line in front of the engine. The production JEM and Kingfisher Sprint exaggerate this, the raised section of the bonnet is exactly the width of the rocker cover. A Mini Cooper 1071S engine was fitted and magnesium Minilite wheels to finish it off. Only one metal DART was made. Returning to aerodynamics: The design of the car was validated at the windtunnel at Weybridge. The theoretical maximum stable speed was 170 mph. However, the car was designed around the transverse A-series engine, so assuming 80-90 Hp at the wheels, using 10" wheels, a 2.9 diff and an engine with an 8000 rpm red line would generate 148 mph. Recall that Jem Marsh verified this when he was recorded at 146 mph on the Mulsanne Straight in the 1967 Le Mans race. Dizzy asks the reader to note that was a Mini Marcos with a streamlined nose cone, however the DART or Mini DART was more streamlined overall. Dizzy agreed that a major influence on the shape of the DART was the Abarth of the early 60s. The finished car was shown on the Paul Emery stand at the 1964 Racing Car show. (See Mini Alternatives for photos.) The letters “D.A.R.T” were on the bonnet. Dizzy recalls that people were more interested in the DART than the Emery GT next to it! 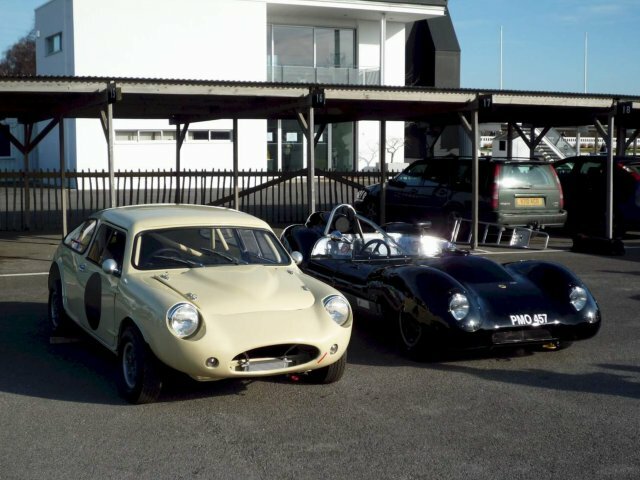 Due to the interest shown at the Racing Car Show plans were made to produce the DART in fibreglass monocoque form. Falcon Shells (Waltham Abbey) were used to produce a plug from the steel DART. The shape was refined, and Dizzy recalls the addition of the lip spoiler at the base of the rear window. 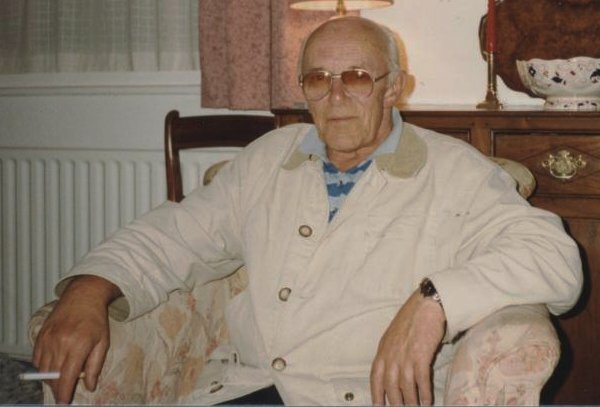 Work was transferred to Walton on Thames (Jem Marsh was involved with Falcon Shells who did some work for Marcos). Approximately 8 fibreglass shells were produced. Dizzy had lined up a friend who was ready to market the car, however there was some disagreement between Dizzy and Jem concerning the quality of the shells and at that point he and Jem Marsh went their separate ways. Dizzy came away with four of the shells and put them into storage. Dizzy then set about finding someone else to manufacture the DART. 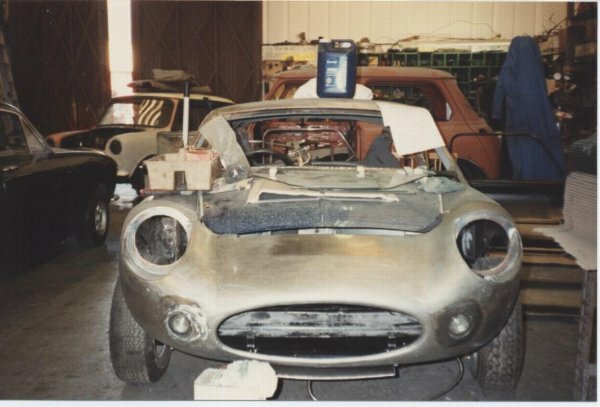 Meanwhile Jem developed the project into the Mk I Mini Marcos. Dizzy finally sold the whole project to Jeremy Delmar-Morgan for 750 pounds via Paul Emery. Jeremy marketed the Mini DART as the Mini JEM. The initial production run was 40 shells. Jem Marsh was not at all connected with the Mini JEM project, perhaps the name was meant as a joke (? ), however my guess is that JEM is to Jeremy as TVR is to Trevor. Dizzy was aware that his racing car projects were interfering with his aeronautical career and returned to the test pilot scene; his interest in cars were put on a back burner. Dizzy couldn't recall what finally happend to the DART, although he still has the 1071 'S' engine which he purchased directly from John Cooper. It has done 2000 miles and is stored under the bed of a friend! Note that Dizzy also designed a fibreglass , one piece rear door replacement for the Mini Van. This was marketed through Paul Emery and was often advertised in Cars & Car Conversions. Postscript: Late in '93 I visiting a company based in Studley near Redditch in the hope of buying a Downton 998 engine for my MkII Cooper. It turned out that the company restores exotic Minis mainly for export to Japan. In one corner of the workshop tucked behind an Ogle SX1000 was a seriously chopped Mini van. Upon closer inspection it had a strong resemblance to the DART without a nose cone. I thought I was seeing things! The company had purchased the DART from Furber's Scrap Yard in Leicester. Furber's called up one day and said "We've got this really weird GT Mini, come and have a look". The car was painted red with a maroon velvet interior and Triumph Spitfire seats, needless to say it was a mess! The bonnet was adapted from a Morris Minor. The car had been owned by a student in Leicester. She had been given the car years ago, she knew nothing of its history and viewed it as a customised GT! It was committed to the scrapyard because it was not cost effective to make roadworthy. The restoration company purchased it for 250 pounds and after a year of sitting gathering dust is now in the midst of a 7000 pound restoration. Sadly, it is ultimately heading for a museum in Japan. The restoration is missing a few key features, such as door gutters. This is mainly due to the fact that not much of the original metal remains and no one really has too much to go on! Only the roof and part of the floor are truly DART. A new nose cone has been fabricated with an oval grill / intake and a rectangular scoop beneath. Most of the panels are double skinned and the door skins are aluminium. The top rear corners of the doors have been rounded off more than the original and a cut down mini bonnet is fitted. Overall the car is seriously low, (my guess being less than 36") requiring a 1071 'S' engine as opposed to 1275 which has a taller block. This was probably the reason why a 1071 was used in the original. Also, jigs are being used to straighten out that famous twist. Incidently, on a subsequent trip we found the original DART nose cone discarded in a skip outside the workshop. We were amused to see that the headlamp recesses were fabricated from cut out Castrol XL oil cans!